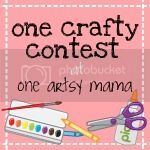 The second week's challenge in One Artsy Contest was Mod Podge! Mod Podge is definitely something I've just barely started to work with, but it's seriously cool! There are several different kinds for different projects and someday I'd like to try them all! The Polkadot Snail was born from a desire to capture my daughter's passion for snails. Every day she goes out on snail hunts, exclaiming over each one and declaring them her BEST FRIENDS! and still be able to hang in her room after she's moved on to some other interest. 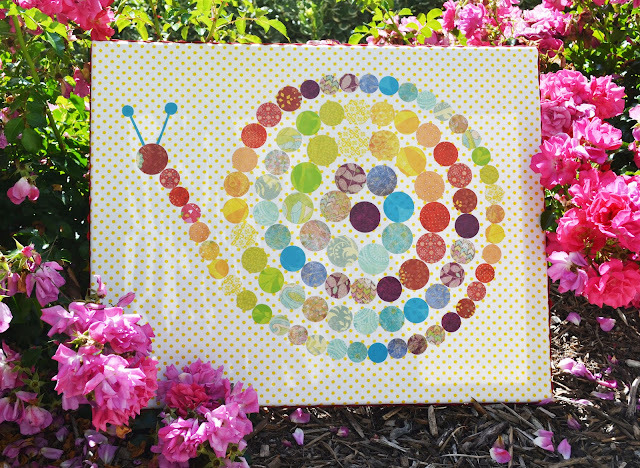 I mod podged my fabric onto a canvas and then arranged my paper dots in a rainbow snail swirl. Each dot was mod podged on then and then the whole creation got a final coat of the magical mod podge. Love. oh my Love!!!! Such a cute idea this is! Too adorable! 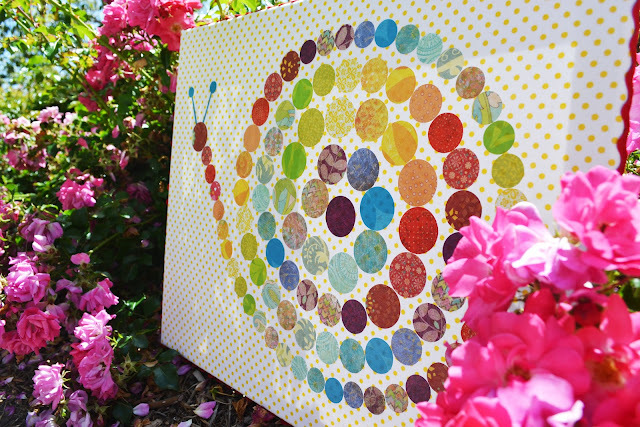 Although around here, the snails are the enemy of my vegetable garden...your little one can come harvest them from my yard anytime! OMG! ADORABLE! Thanks for linking to Sew Crafty Saturday! Oh my goodness, this is just too stinkin' cute! I am going to do this for my daughter's bedroom makeover--we're doing a bugs/garden/outside theme and this will be perfect! Thank you so much for sharing this fabulous, adorable piece! ps-check out my garden snails windbreaker! That is seriously awesome! I love modern art that's easy. Stopping by from Get School Saturdays! I so stinkin' love this! I voted for this one too!! You have a lovely blog and this project is so cute! I need to try this. I'm a new follower! Very cool. At first glance I thought this was a quilt. It would definitely make a cool one! This is super cute! Would make wonderful art in her room I'm sure! I might have to attempt to recreate something similar for my daughter! Mod Podge is such a wonderful thing! I love your project. The colours all look amazing together. So pretty! If you're looking for another place to share your creative ideas, check out Etcetorize . Would love to see you there! this turned out darling, thanks so much for linking up! SUPER SWEET!! I love the graphic design nature of what you've done! Cheerful, colorful, happy and dare I say: groovy! Nice! I love it! So colorful. So adorable! Thanks for linking up and sharing!! Aww- this is sooo cute! 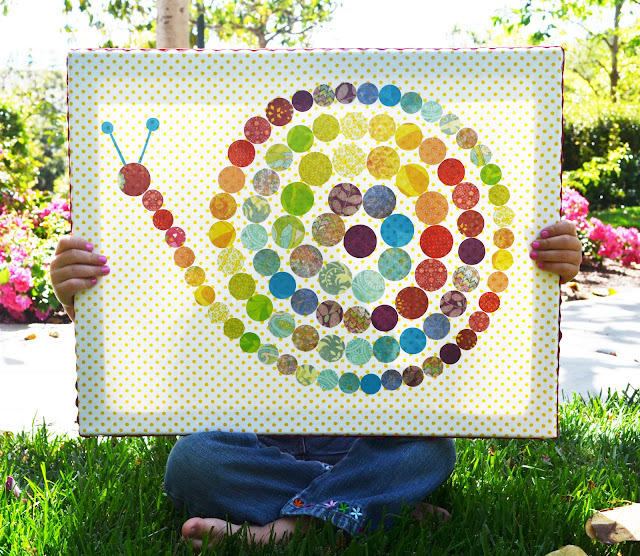 Completely adorable and I am also a huge fan of mod podge! That is really cute and colorful! Nice job! That's really cute! I might try to create something similar for my nursery. I can't even tell you how much I love this... it's amazing! That is so bright and fun! What a cute new snail friend for your daughter. This is super cute! I found your blog through Somewhat Simple blog party and I would love to invite you to share this, and any other posts, at my Creative Thursday Link Party (open through Monday each week) at www.michellestastycreations.blogspot.com. Have a wonderful weekend. I saw this project in the contest and voted for it. Soooooo cute. THanks for sharing at our party this week. This is sooo awesome!! I've been trying to figure out what I could possibly do with scrap fabric in order to decrease the waste, and you've given me some ideas! Thank you, and again, what a beautiful piece! So apparently I'm the only one but I'm a little confused. How did you adhere the 'dots' that make up the snail? Are they just modpodged to the fabric? Are they sewn? How do you keep them from fraying? I think I'm missing something here but it's a super-cute idea! This is the cutest thing ever! What a great project for all the left over scrapbook paper I have! I am now following your blog. Check out mine is ya get a chance =) I'm just starting out. You're a STAR tonight over at I Gotta Create! 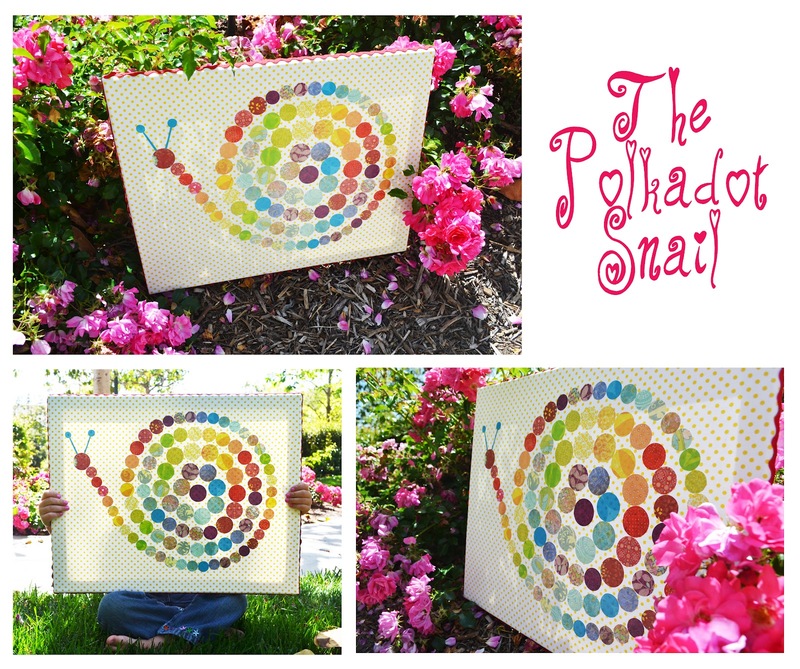 Thanks again for linking up this adorable little snail. This has to be one of the most adorable things I've ever seen! I love everything about it. I'd be thrilled if you'd brighten up the party over at Off the Hook! This is soooo cute! I want one in my garden! Sweet! Added this to my pinboard! WOW, I love this and it's simple enough to do with my Special Ed class. Thanks so much for sharing! This is absolutely precious and I'd love to try something similar in my girls' bedrooms. Thanks for the inspiration-SUCH a cute project!